Is this not a major problem or what? I always struggle with makeup work and I'm really excited to share with y'all my newest system for making sure absent students get their makeup work. So, what have I done in the past? In the past we've had a "While You Were Out" bucket. If a student was absent, I would put the work in the basket and they would be responsible for checking the basket when they returned. The only problem was I was so busy with actually teaching the lesson and getting everything done in time, that I would forget to place the work in the basket half the time. To solve this problem, I had the person who was sitting next to whomever was out place the work in the basket. This made the problem worse! I was constantly reminding students to put their friend's work in the designated area and if they forgot, I'd have that immediate question from the next class saying "What do I do with this work on my desk?" I knew I needed to change the way I did things. I was browsing The Mailbox Gold toolkit recently and discovered these door hanger reminders. I immediately thought about using this for my new makeup work system. Whenever I give out work, I have a tray close to my desk that holds extra copies. I try to put these back into files at the end of the week to keep everything organized. 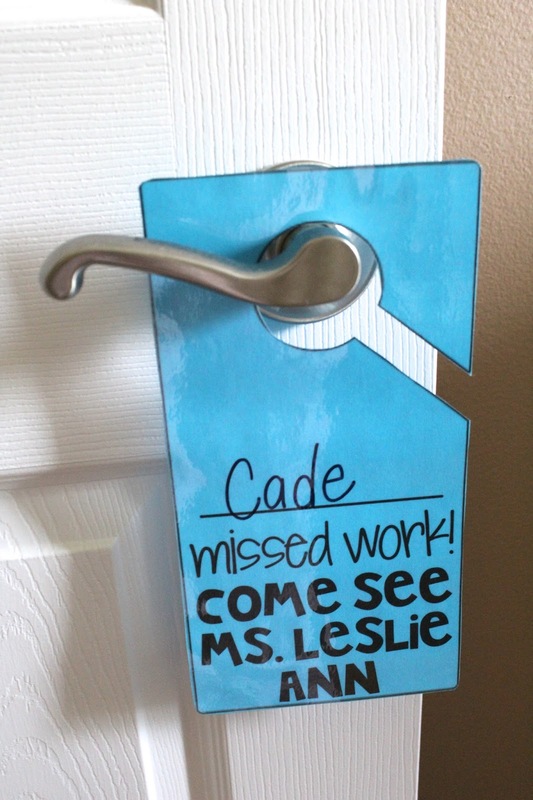 I decided instead of having a tray for the students to check, which they forget half the time, I simply write the name of the missing student and hang it on the door. That way, they are much more likely to remember to get their missing work! (Or someone will remind them! Trust me!) The toolkit has a door hanger template and then I just typed the text on it. I laminated them and that way I can use a dry erase marker to write the name. Now what about those who missed an assignment that they can't make up? I always run into this problem! Lots of my lessons involve group activities like sorting or collaborating to create examples of whatever we are discussing and those contain a huge part of the learning portion of my lesson, so the absent kid misses out. I always hate when students miss those types of lessons because they've missed a major skill. I like to have worksheets that cover the same topic, just in a different way. This way I know the students are still getting the lesson/skill even though they missed the collaborative part of the lesson. The Gold Toolkit has tons of sheets that are CCSS aligned so it's easy to find sheets that cover the lesson that student missed!